1655 Within ten years of the first beginnings of Quakerism, two travelling ministers, John Stubbs and William Caton, visited Ashford. They had “great Meetings, strong contests and opposition. 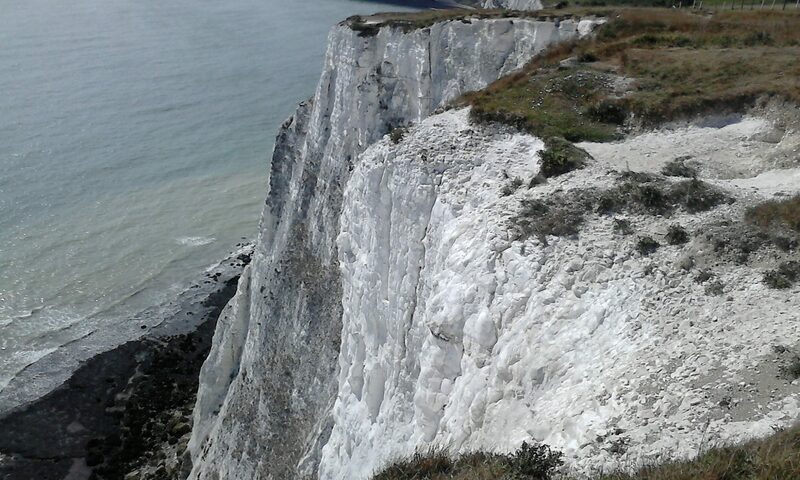 Howbeit, some they found simple and tender hearted.” Mary Jacobs, a widow, received them into her house in Ashford. Very soon Quakers were being persecuted because they refused to attend worship in the “steeple houses” of the established church, and because they refused to pay tithes and other taxes which they considered wrong. The following is an early example in Ashford. 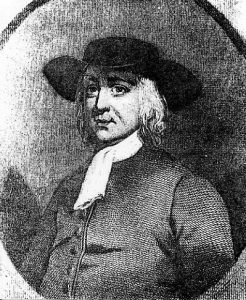 1662 George Fox – the founder of The Society of Friends – visited Ashford and had a “quiet and very blessed Meeting”. 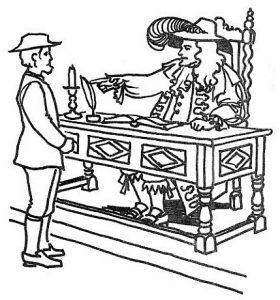 1673 Ashford Monthly Meeting, consisting of Ashford, Mersham, Lydd and Wey (Wye) local meetings, was established and for a number of years was held at John Brett’s at Mersham. 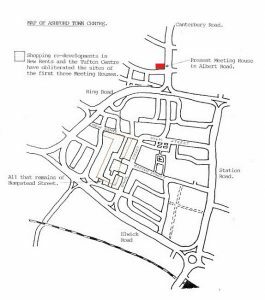 1674 Negotiations were commenced with Robert Stead for the hire of a property in Ashford to use as a Meeting House. It was agreed to hire the property for one year at a rent of £4 and for subsequent years at a rent of £3 per annum. 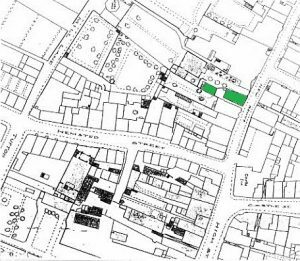 There is no direct evidence where this, the original Friends’ Meeting house, was situated, but it was most probably on the site of what was later No. 11 New Rents, on the south side of this street. 1676 John Tritton, a Quaker of Kennington (hence Tritton Fields), gave a corner of his field for a burying plot for Friends. This burial ground is still in use, the only Quaker burial ground in Kent still being used. 1678 Friends finally purchased from Robert Stead the building in New Rents that they were using as a Meeting House. 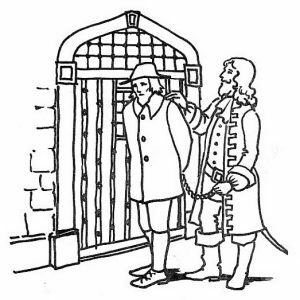 1682 Robert Stead of Ashford was sent to prison by order of the Quarter Sessions on an indictment for absence from national worship. Sometimes under pressure from these or other penalties, Friends “apostasized” or returned to the established church. An example of this is recorded in the “Book of Sufferings”. “Apostates. Wm. Beane received ye truth, and suffered for the same, yet afterwards apostasized from it in a miserable condition. John Edwards likewise received ye truth, and bore a publick testimony for it, but apostasized”. 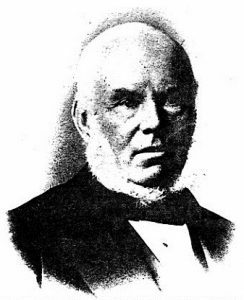 “In duty I am bound to say that nothing was prosecuted at the last Quarter Sessions against the Quakers, nor the rest of that diabolical rabble, although several bills of indictment have been framed and presented at Sessions against that viperous brood, yet by reason of most in the Grand Jury are fanatics the bills were not found…”. Kent Archaeological Society records show that there were 51 births into Quaker families in Ashford between 1660 and 1732 (it is possible that ten years at the end of the seventeenth century are unaccounted for). 1761 Because of changes in the numbers of Quakers in Kent, there was some re-organisation of Meetings. Ashford combined with Folkestone as a single Monthly Meeting and Ashford became the first “Preparative Meeting” in the County. This initiated a more formal structure of local worship groups. 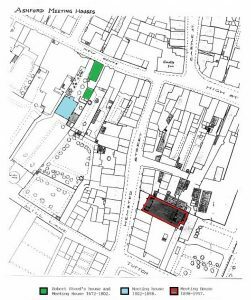 1802 Friends bought a property for use as a Meeting House on the south side of New Rents, replacing the one bought in 1678 which, fronting on to the street, had become too noisy. This building (No. 13 New Rents) and the original Meeting House (No 11) were re-developed in 1899 to become part of Lewis & Hyland’s grocery store, which was itself demolished in the 1970’s. The property included a garden which was let for £4 a year. Part of the garden was used as a burial ground, and the remains from here were subsequently re-interred at Kennington. The new Meeting House, which was originally a Baptist Chapel, cost £400 to buy. The sale of the old building realised £100. 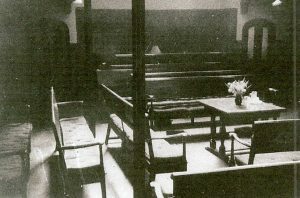 The pulpit taken from the chapel was sold for £6 – Quakers having no use for pulpits. 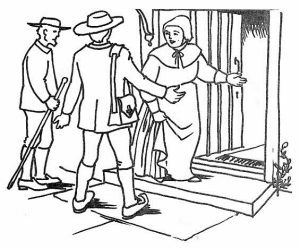 During the latter years of the 18th century and much of the 19th, Quaker tended to turn in upon themselves as a group and membership tended to fall. In 1879 there were only 118 Friends in the whole of Kent. About this time in Ashford, Quaker membership really only consisted of the members of three families. 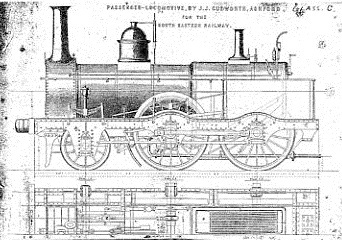 1845 An Ashford Friend and trustee, James I’Anson Cudworth was, at the age of 18, appointed the first locomotive superintendent of the South Eastern Railway at Ashford. He had previously been an apprentice to George Stephenson of “the Rocket” fame in Darlington. 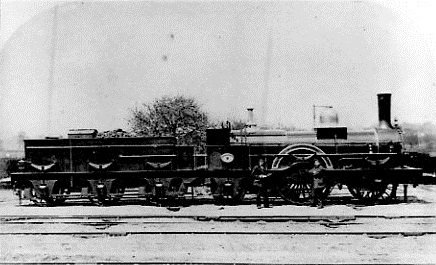 He was responsible for the design of all the locomotives built at Ashford Railway Works until his resignation. He lived at 1 Barrow Hill Place. James Cudworth, together with his friend and distant cousin Henry Headley, was instrumental in establishing the swimming baths in Beaver Road, in their time they were the largest open-air baths in the country. 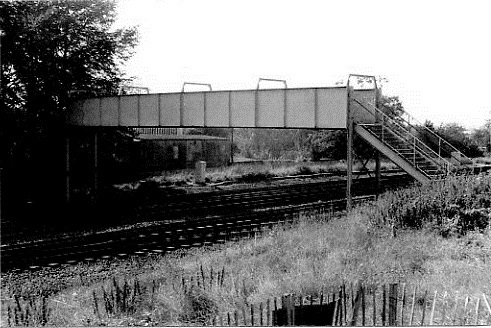 Hannah Maria Headley (Henry’s wife) was concerned that children had to cross the railway lines to reach the new Victoria Road School and, together with others in the town, she was instrumental in getting a footbridge built which carried the footpath from the market to Victoria Park over the railway. Towards the end of the 19th century a reversal of the fall in membership numbers took place, based upon an evangelical revival which was mirrored in many other non-conformist groups. Particularly in Ashford, this resulted in the development of the Mission Halls in Aldington and Challock. 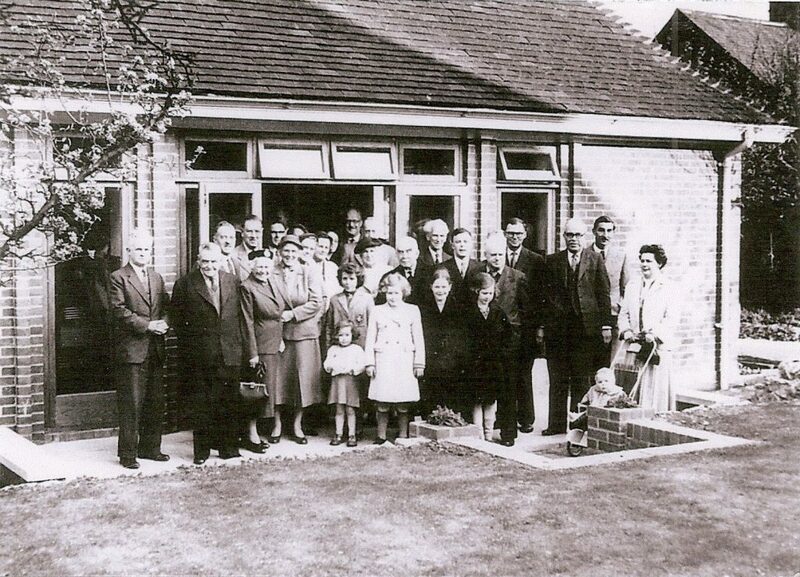 In 1889 Ashford Friends held mission meetings attended by up to 60 people. 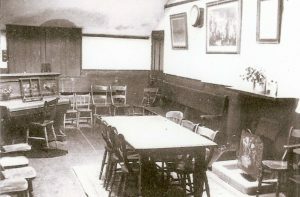 Aldington Mission Hall was bought in 1990 and the Challock Mission was set up in a hired Methodist Chapel in 1901. Mission work was so successful that in 1908 a Friend was appointed to live at the Aldington Mission to promote the work in the village. 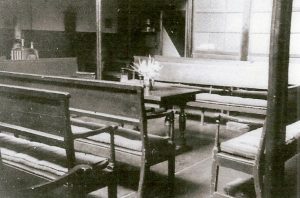 A conference for “First Day” (Sunday School) teachers was held at Challock in the summer of 1909. In 1922 Aldington Mission Hall was sold. Mission activities continued at Challock until 1940. During the last half of the 19th century and into the 20th century, Friends became actively involved in the “Adult School” movement. Organised by Ashford Friends the Adult School used the Hempstead Street premises for many years. In 1898 Friends purchased a chapel in Hempstead Street from the Unitarians for use as a new Meeting House. 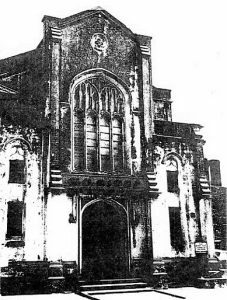 This was described as “having a large and utterly unquakerly gothic revival window over the entrance!” The building was sold in 1956 and eventually demolished in the 1970s to make way for the Tufton Centre. 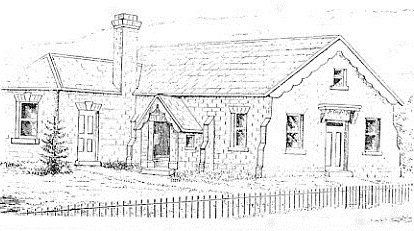 In 1956/57 the present Meeting House in Albert Road was built. It is the first Meeting House in over 300 years of Quaker history in Ashford to be purpose-built by Friends.